Meet a stunning mobile computing experience in a very thin and lightweight Apple tablet PC. The iPad Air is powerful and efficient at the same time, thanks to its A7 chip and M7 motion coprocessor, on which the iOS is running. These features, put together, make multitasking a breeze and let you spare battery power. Sporting a 9.7-inch multi-touch screen with Retina display, the Apple iPad Air delivers a 2048 x 1536-resolution, over 3.1 million pixels and enables you capture beautiful, sharp photos. 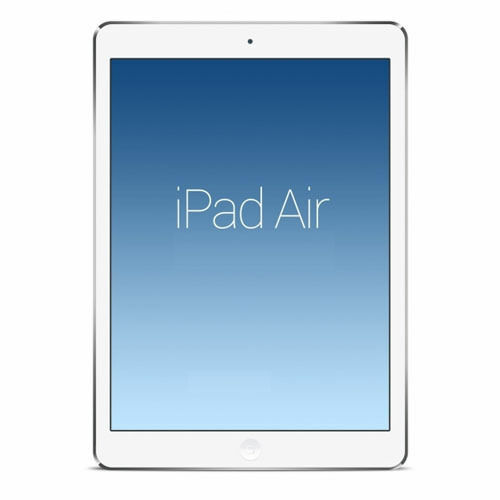 The Apple iPad Air comes in capacity 16 GB, so you can store anything you want. Supporting Wi-Fi or Wi-Fi+4G connectivity, this Apple tablet PC makes your browsing and downloading experience very fast. Moreover, the 5 MP iSight camera on the Apple iPad Air with advanced optics improves still image and video capturing. The 1.2 MP FaceTime HD camera, featuring a backside illumination sensor, brightens up and improves your video calls overall. This Apple iPad comes in silver finish and works with Sprint cellular network. It's also compatible with U.S. Cellular, Straight Talk, Verizon, T-Mobile, Boost Mobile, AT&T Carriers. I would like to send one back and swap it for another? Can we do that? I have put 10 hours and can't get this to work it says "cracked glass" but there was everything completely destroyed on both!,, I want to send back swap the black. It had bad charging port, broken LCD, broken backlight, cracked motherboard! This wasn't explained not at all Do you have something closer to fixable "cracked glass" as I paid $150! Best tablet that I have used period!! Needed to purchase a second I pad to keep peace with the family. It seems to be faster and easier to use than the older models. Amazing tablet. Long lasting battery. Amazing colors.